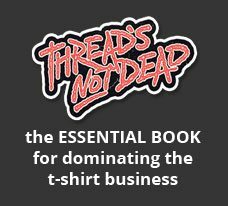 I recently wrote an in depth review on big cartel and thought it would be nice to also showcase the best bigcartel store examples. 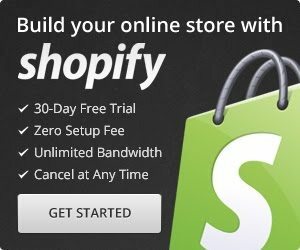 These sites stand out from the rest and really push what can be done in bigcartel. Custom slideshows, layouts, type, and menus all come together to make these sites stand out from the rest and make them the best bigcartel stores. Parachute is my favorite bigcartel website. 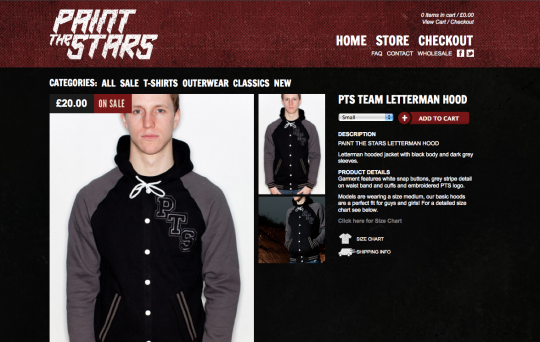 Everything about it is custom and it fits their brand perfectly because of it. I love the custom slideshow, custom dropdowns, and that magnify button to increase the size of the products on the front page is a great idea to. I also like that the type is all done without pictures and they use adobe typekit to use any font they want on their site. I had to double check to make sure this site used bigcartel because it is so different then everything out there. It seems like every other person that comes to me for bigcartel web design usually mentions Ugmonk as a reference to what they want. 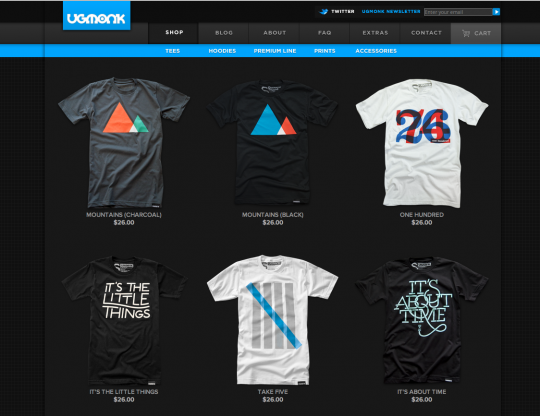 Ugmonk is actually on bigcartel and wordpress. This was the first website that I saw that did this and ever since I have been combining bigcartel and wordpress sites to get the best of both worlds. 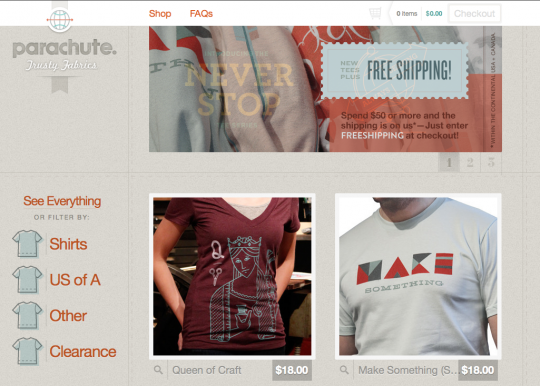 The same thing can be said about the web design as for Ugmonks shirt design, amazing typography. Everything is laid out so well and there isn’t much flash in the design it’s just simple and well designed. 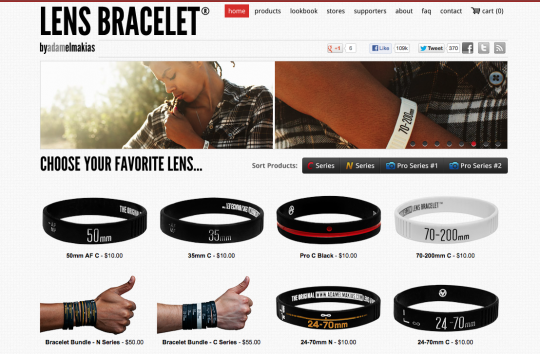 Another well laid out and great typographic site on bigcartel is Lens Bracelet. This site has a lot of info in the footer with an about, top selling, and faq section. 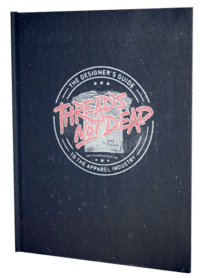 It gives you a lot more information then most bigcartel sites do about it’s brand. On the product page there is also a “Others Also Bought” section which comes up with products in the same category you are looking at (a very smart way to get more purchases). Super simple with a subtle design in the background. I like how 410 BC’s categories are set up, having it fit perfectly in with the site. The site also matches the brand very well. I helped add a wordpress site onto this. 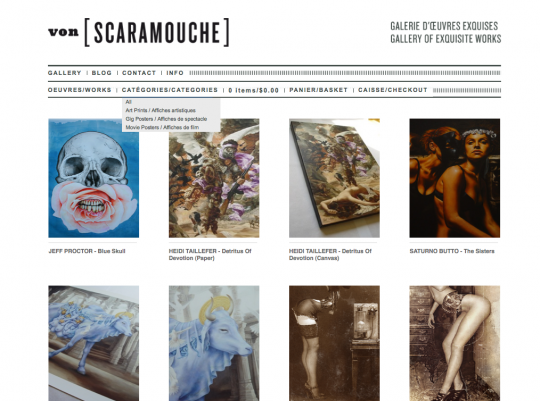 At the time it was a website and bigcartel site that were completely different designs. I changed it so it was one design across the two sites. I worked on this website with my web development company Double Dragon Studios. 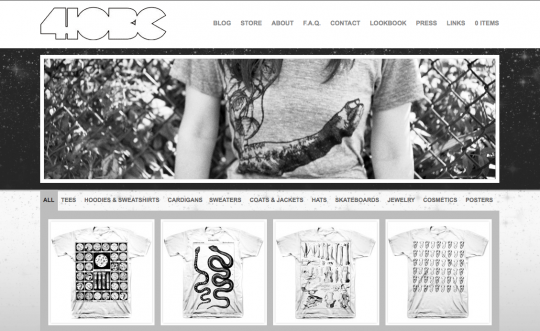 We used bigcartel for the e-commerce and wordpress for the blog. What I like about this one is that everything has been modified. We have a categories and works dropdown so users can find items better. The product page and cart are completely custom. It was just something different then other sites I’ve built. You gotta love this product page on Jon Knox’s bigcartel page. He uses all the space and fills it with enormous and beautiful product pictures and information. I also love how simple the navigation and typography is throughout the site. I have worked on a couple Paint the Stars sites and this is their newest. 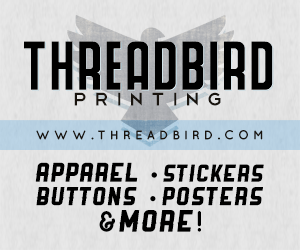 We decided to have the FAQ, Contact, and Wholesale pages all open up in a light box. Dave from Paint the stars just wanted to make it super simple and not make users go so a completely new page to get all the info. We used a google font for all the titles and I really like how it all turned out. 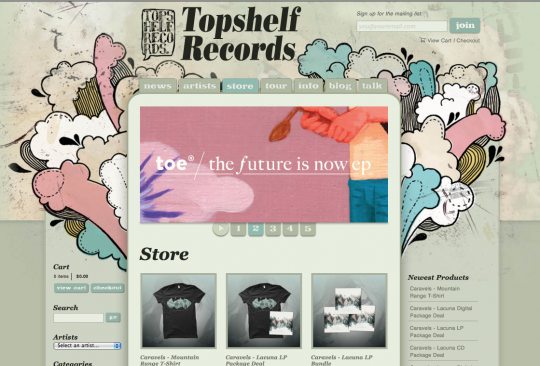 The website for Topshelf Records blends a bigcartel and tumblr site perfectly together. I love the design and how much functionality the whole site has. Slider, blog, tour page, artists, they definitely needed some more power then bigcartel to manage all the pages content and they have done a great job with the tumblr add on. 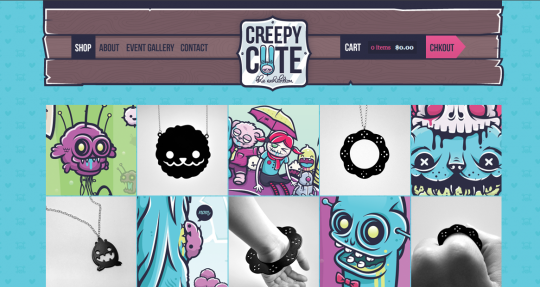 Creepy cute’s site fits perfectly with the brand. I love the typography but on closer inspection the a lot of the fonts are images instead of html. On the product page the title, price and category are all an image so any time this info needs to be updated they need to redo the picture. All the type could have been done with a google fonts equivalent or type kit. Yes I love the design but what I love about web design is using content management systems to make your life easier. Amazing looking site none the less.